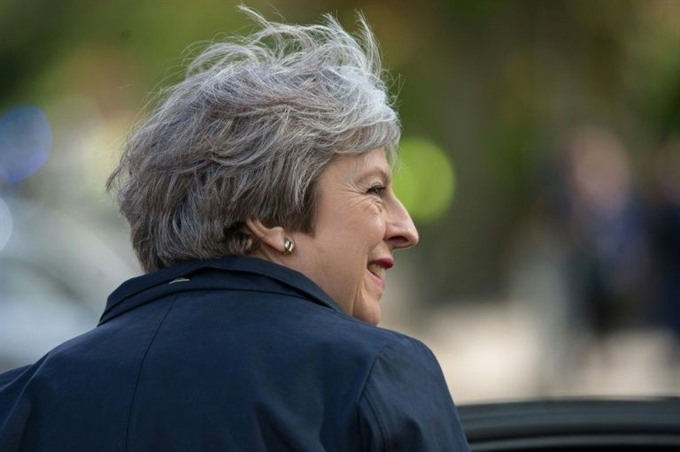 LONDON — Ballots were being counted Friday from local elections in England seen as the first key electoral test for Prime Minster Theresa May since she lost her parliamentary majority last year. Polls closed at 10pm (2100 GMT) on Thursday to elect local councilors and early results were due to be announced overnight, but a clear overall picture is not expected until later Friday morning. May’s Conservative party is braced for defeats in London, where all 32 local councils are up for grabs, and which is a traditional stronghold of the opposition Labour party. But the elections took place across England, including in cities such as Manchester, Leeds and Newcastle, with a total of more than 4,300 seats being contested. In London, where last year’s Grenfell Tower fire disaster in which 71 people were killed is still a fresh memory, some residents said they were using the vote as a proxy poll on Conservative leaders on both local and national levels. Charity worker Joe Batty, 54, cast his ballot when polls opened in the borough of Islington at 7:00 am (0600 GMT) Thursday. "The cuts to the local councils, that’s come from the central government austerity," he said. Pensioner Joyce Mason, 79, said cuts to hospital services had weighed on her decision. "My husband went in hospital the day after Boxing Day — he was delirious, he was very ill but he was on the trolley from six o’clock in the morning until one o’clock the next morning", she said. "I know they’re under stress, they are under a lot of stress at the moment. But we’ve never had nothing like this before." Turnout is usually low— only around one third of voters bothered to cast their ballot in last year’s local elections, compared to 69 per cent in the national vote in June. Since then the government has been rocked by divisions over Brexit, as well as a recent scandal over its treatment of Caribbean citizens who emigrated in the 1960s and 1970s, and which led to the resignation of a senior minister on the weekend. National issues often factor in the local elections, which offer a chance to send a mid-term message to the government, and Labour leader Jeremy Corbyn is hoping for a boost. But Corbyn’s resurgent left-wing party is far from guaranteed to sweep to victory given its turbulent rise to prominence. Before her vote, taxi driver Jeanette Barton, 64, said she would break with her family’s tradition and vote for May’s party. "I’d like to kick Labour out... so I’m voting Conservative", she said. "I don’t like Jeremy Corbyn," she added. EU citizens are able to vote, unlike in general elections, and some campaigners have been pressing Brexit as an issue.